Print the coupon and save money! 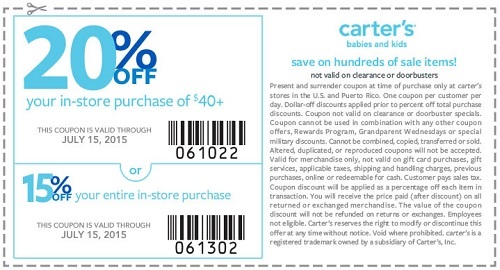 Save with sale coupon at carter's stores in the United States. Take 20% off your purchase of $40 or more! Or, take 15% off your entire purchase! Just print the coupon and save money! Source of the information is carter's. More information available at stores.